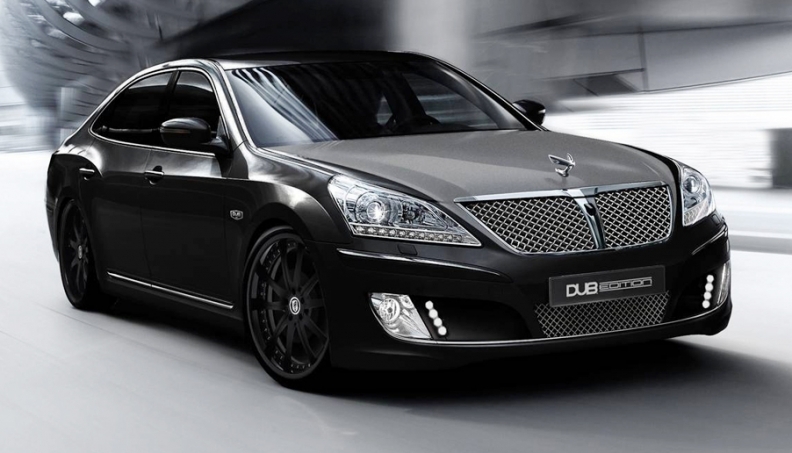 Exterior modifications for the Equus Dub concept include a mesh grille, custom body kit, tinted windows and tail lights, and a custom two-tone, gloss black-and-matte charcoal paint job. The concept also features a custom suspension riding on 24-inch modular style wheels. Hyundai apparently wants to create an urban legend. Hyundai and Dub magazine have teamed up to build a customized version of the automaker’s new flagship, the Equus sedan. The Dub Edition Hyundai Equus concept will debut at the Specialty Equipment Market Association show, scheduled Nov. 2-5 in Las Vegas. The magazine covers urban custom car culture. It also features celebrities with their customized luxury vehicles. The 2011 Equus goes on sale in November and is aimed as an alternative to Audi, BMW and Mercedes-Benz sedans. The Equus Signature sedan carries a $58,900 sticker price, including destination. The Equus Ultimate is $65,400 with transportation. Exterior modifications for the Dub concept include a mesh grille, custom body kit, tinted windows and taillights, and a custom two-tone, gloss black-and-matte charcoal paint job. The concept also features a custom suspension riding on 24-inch modular style wheels. The interior features custom leather and suede, an illuminated headliner and custom rear bucket seats.